Wewwww!!! This is the first ever phone review/evaluation/nagkakalat si Mari that I'm gonna do! I was privileged to have been given the chance to try out OPPO's F3 Selfie expert for myself. The commercials and out of home ads have always intrigued me because it's always about Sarah G. taking selfies. I mean like phones can do soooo much more than just selfies, so why just focus on that? Until I tried it myself. I saw for myself that plenty of the little things that make selfies a lil' hard for our vanity, OPPO has something to counteract the problem. I'm no tech blogger so I'll never be able to give a very technical breakdown of the products, but I'd like to speak of my personal experiences on using the phone. What I love about this phone is that the box alone is decluttered. It's not like the boxes of other brands that are filled to the brim with specs, brand jargon, and basically information overload. I love that there are 4 simple promises that are easy to evaluate the phone by. So there's a 16 Megapixel + 8 Megapixel dual selfie beauty camera, a 120º Wide angle dual selfie camera function, fingerprint access on the home button, and 4GB RAM with 64GB storage. This is the sticker on the unit I got. 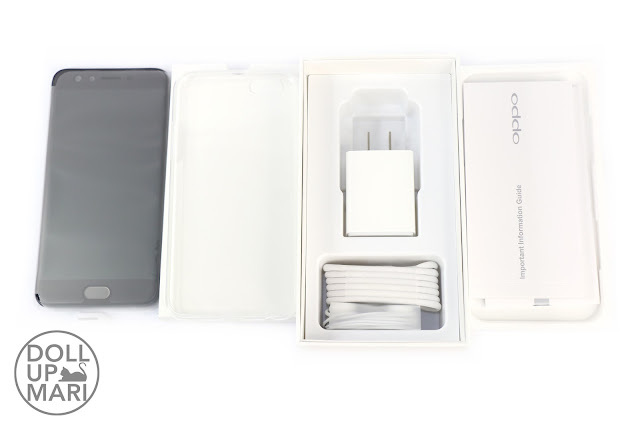 Inside the box, there is of course the phone, a complimentary clear jelly case, earphones, a charging cord, and a charging brick. Plus all the manuals and booklets. There is now a red version of this, but I feel that black is always a good color because it's timeless. I can always envision black to look good in the eons to come. 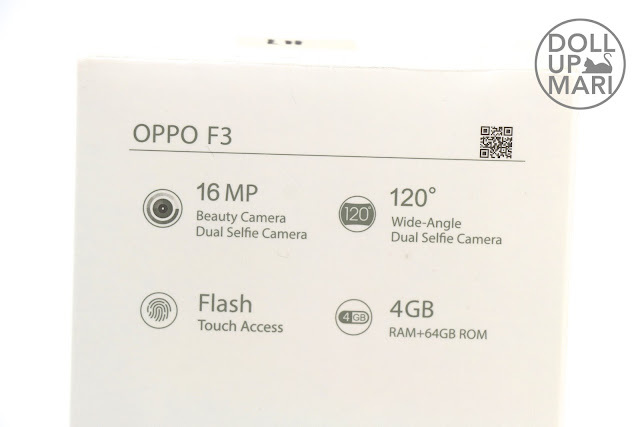 This is the back of the phone's packaging. As seen on the signage, this has a dual sim, and is supportable with Miro SD cards (although it's gonna be soooo long before you need card support as they have a generous 64GB of storage space on these devices). This is how it looks like beside an iPhone 6S. 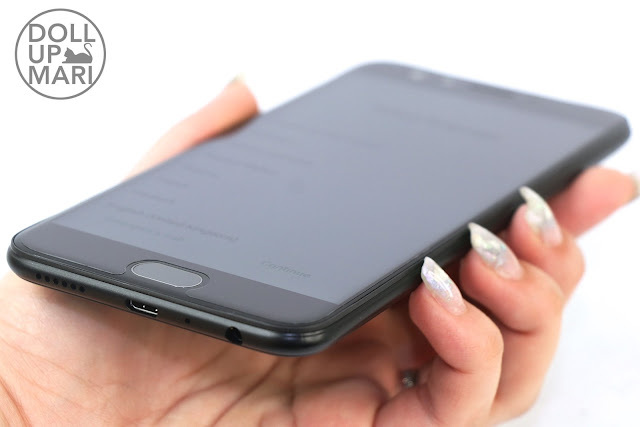 It's slightly bigger, but the screen size is significantly larger because OPPO's screen goes from edge to edge on the sides. 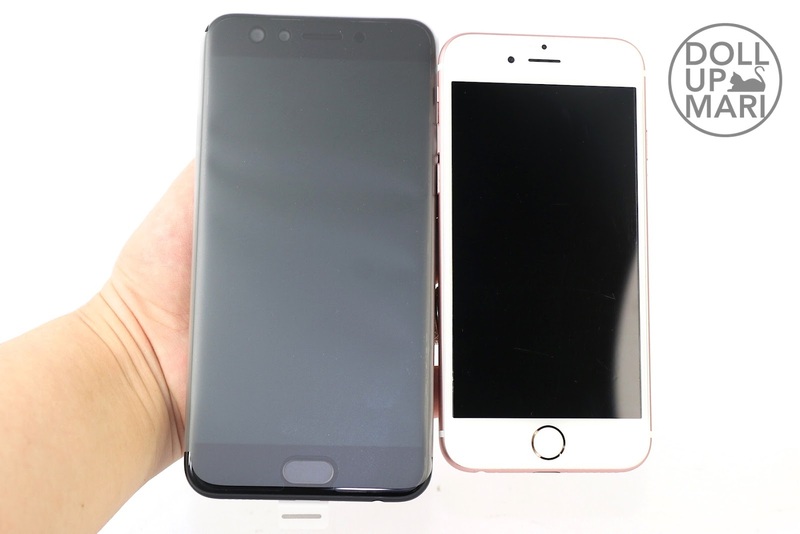 This, based on feeling, is more or less just as liight as a 6S despite being bigger. It's also not significantly thicker, prolly just 1mm thicker based on visual evaluation. Generally, both phones are thin. One suuuuper megaaa thoughtful thing about this phone is that it already comes with a screen protector straight from the box!!! I'm soooo shoookt!!!! OPPO doesn't make so many kinds of phones, so that they have the resources to really pay attention to details like these. 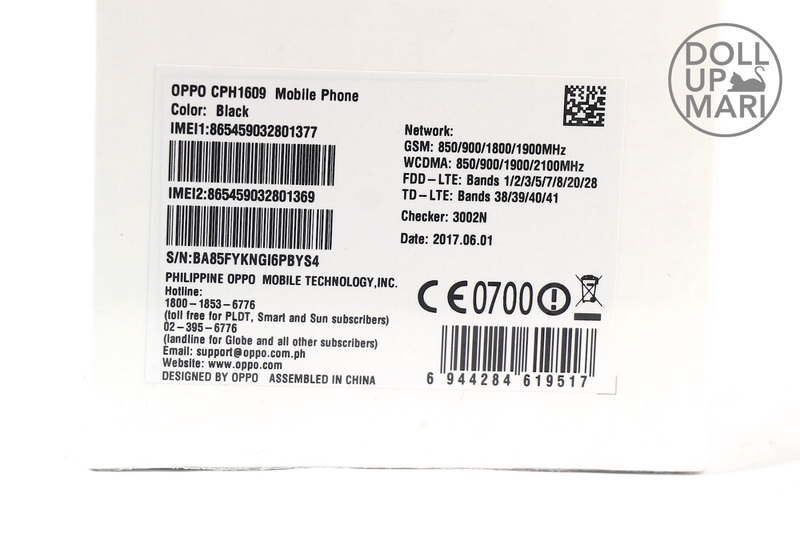 Unlike brands that churn out 100000 phone models to the point that customers are having headaches with accessories and parts, OPPO has less than 10 models, that's why they can put more care into each one. After sales is something they pay attention a lot to. I really super loved this part because it's such a big convenience. 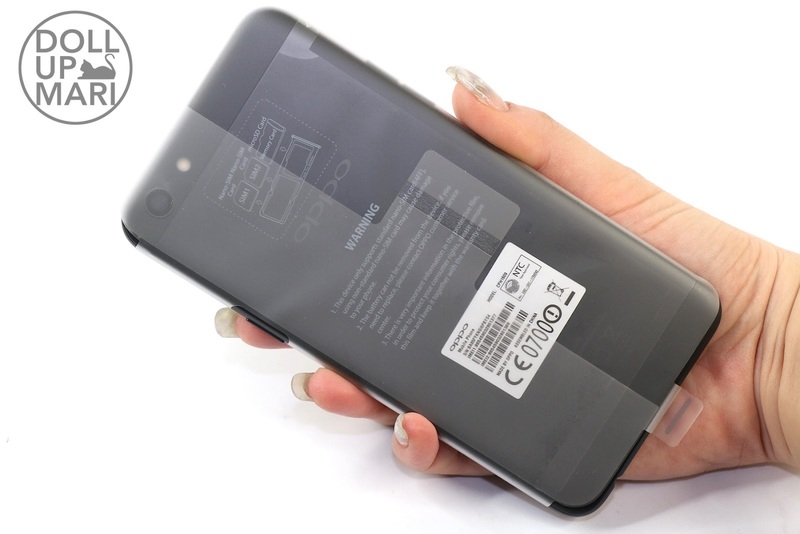 Usually screen protector makers only make the for brands who have been around for longer, and it's gonna be an extra expense and a special effort on the consumer to get it done. I love how they solved this by themselves. 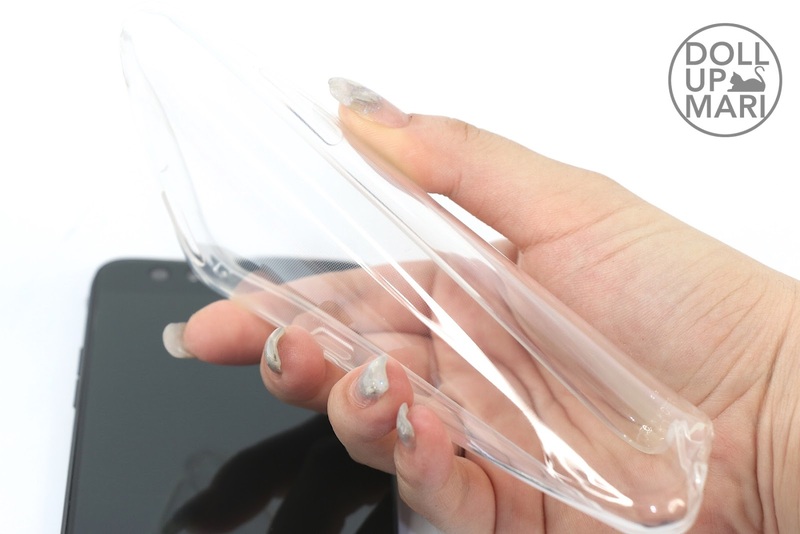 Replacement protectors can also be easily availed through their channels. We're in 2017 but they're in 3017 on this one. Another super thoughtful addition is the clear casing!!!! I like how this is already in the package and not an extra expense the consumer must shoulder. 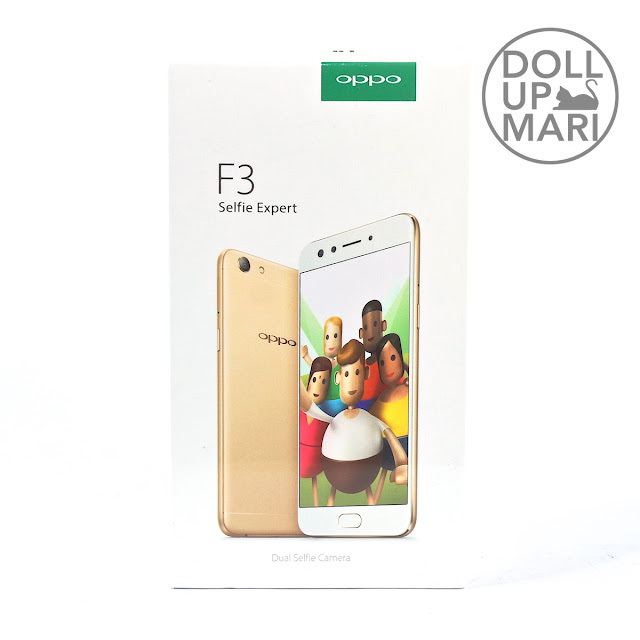 It's also so relieving to know that no matter what, the OPPO stores have got your back. When I was on another Android brand, the brand store didn't sell cases, and since the brand had 1000000 models, it was a pain in the neck whenever I needed a new case. The cases from 3rd parties were often soooo tacky, and nothing was practical, nothing was functional. 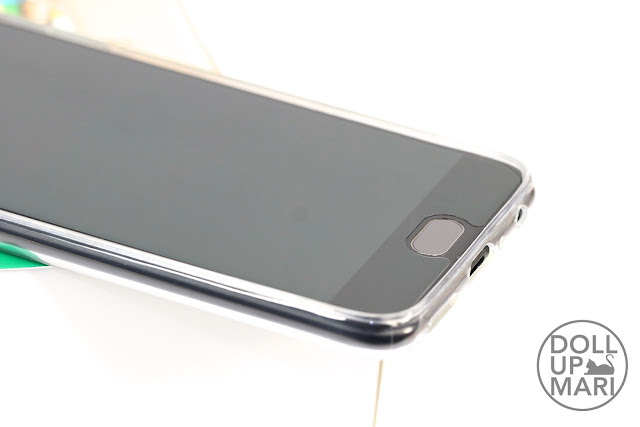 I like how they have something as simple as this clear jelly case which gets the job done and is reasonably durable. This is how it looks a little bit up close with the case and screen protector. 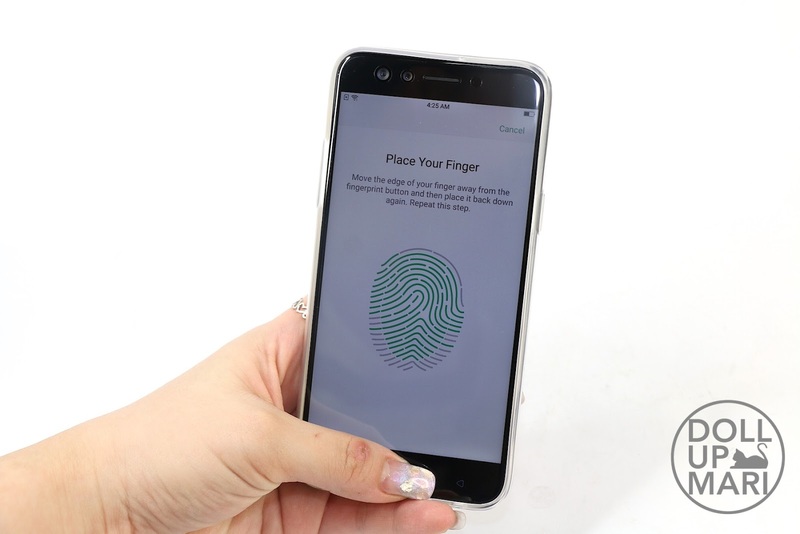 The other great thing is that they have a fingerprint option! 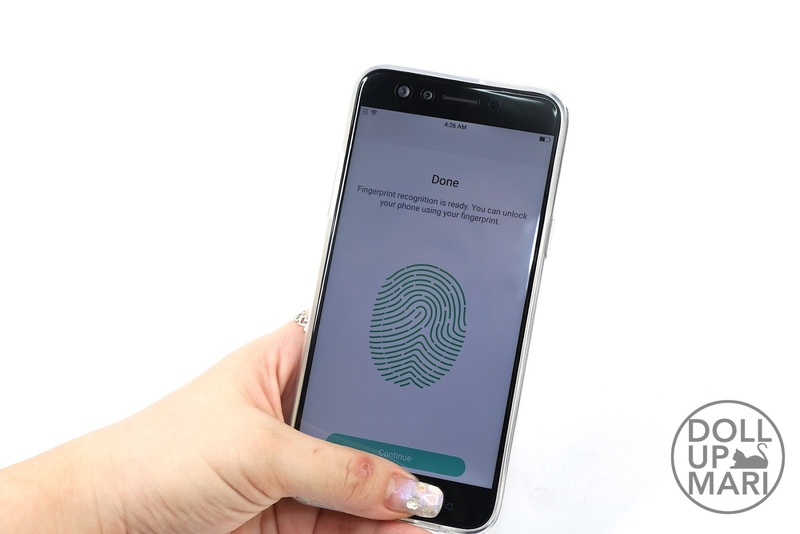 My nails are so long that I find it sometimes hard to keep on typing numbers or swiping on the phone, so I really like that this one also has a fingerprint function. This is as fast as the iPhone scanner, so this is not a sorry imitation as some may think. It's really fast and natural too. I actually came to this review comparing it as an equal to the iPhone, because it really is powerful. 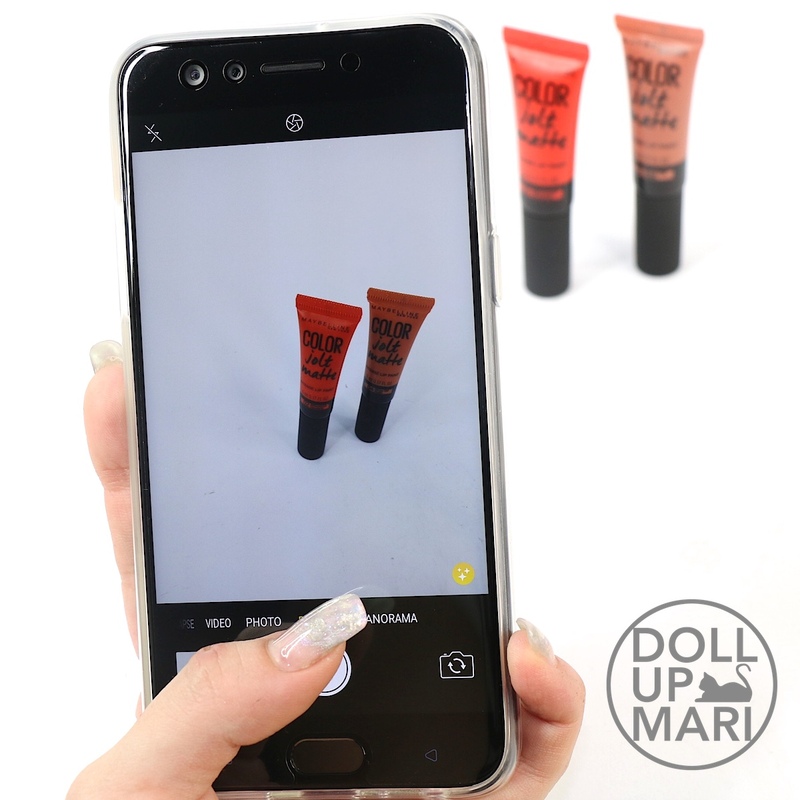 Of course the first thing I do is to try to take product photos. This phone is definitely not as powerful as an SLR, but what I like is that it filters out the specks of dirt on the white surface, making it more acceptable. This is how it looks like when it comes to the screen. It's edge to edge. I feel that the screen is more or less true to life. This is what I caegorize in my head as an OK YouTube screen. OK, I'll be real now, in the throngs of bad comments we get that our videos are of bad quality, we often wonder where the person is viewing our videos. There are gadgets like these that are considered as high end devices. And then there are garbage devices. If you say something bad about my video quality while watching on this device, I will take it as constructive criticism. 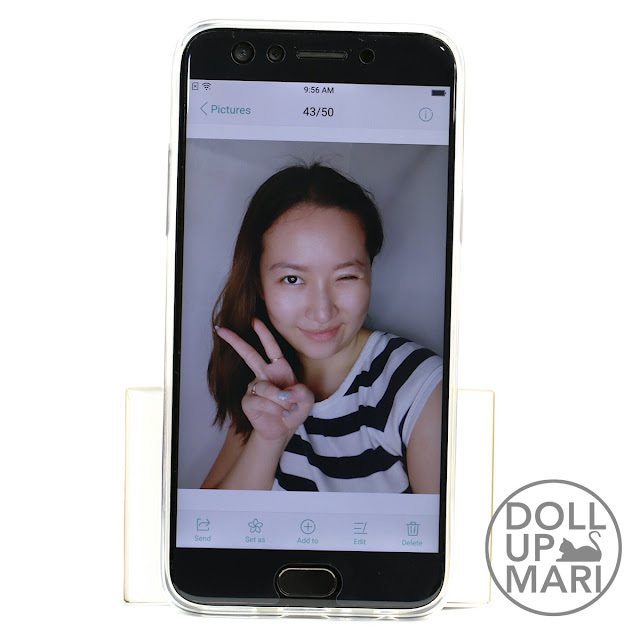 Of course, the most important part is the selfie camera. AND THE BUILT IN BEAUTY MODE! But hey! It's literally built in! Swipe right during photo mode to go to beauty mode, just like how you would swipe between video mode and photo mode. I have plenty more photos to show comparisons! But before I forget, I feel that the key takeaway from this is that the best part about the selfie camera is that the beauty mode filter is strong, but the camera itself is very high-res, so the end result is a photo that's so prettified but still natural looking (assuming they don't see the before photo without the filter). It still looks genuine. I tried using the beauty mode on other new Android phones, and I noticed that if the phone's camera is not too good, the result is a look that looks over photoshopped and over airbrushed. Or like the skin's too creamy it looks too good to be true that you get weirded out looking at the photo. And now for the comparisons! This is what I mean by how it's a combination of natural and powerful. If you try to cover the left side of this photo and just look at the right side, your eyes would believe that this was naturally possible. The elements on the back like my beloved Ellen Adarna calendar, the door, cabinets, etc., still look like themselves. They don't look like a weird blur. You can also see the details on my earrings and dress still present themselves vividly and with much texture. I have seen cameras and apps that just blur everything out that is already looks like a very overtly done filter. I also like that my makeup did not fade between normal and beauty modes. 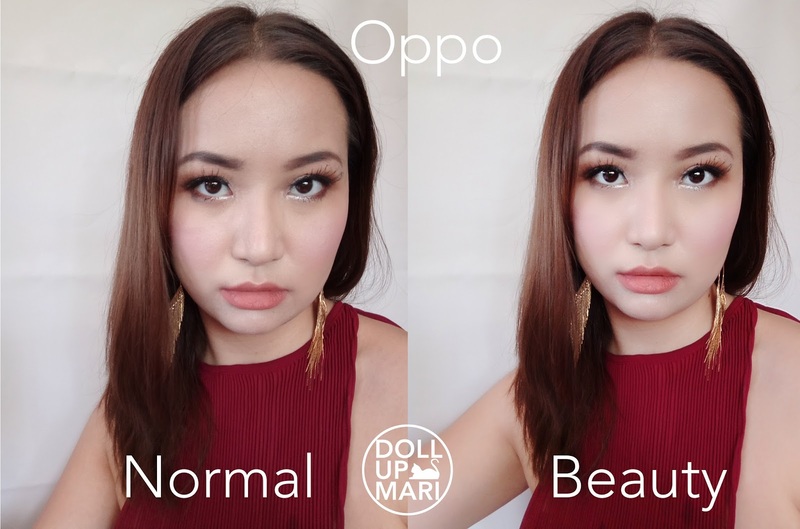 One issue I face with beauty apps is that my makeup fades or becomes duller in beauty mode, which is something that is of course undesirable if you want the vivid colors of your look to pop. I like that the color temperatures and vividness are the same between each mode, and that in general, these look true to life. It's like I just got free BB Cream, but generally my brows, lips and eyes look the same color wise. But honestly, I really wanted to see the talent of this camera when I don't have makeup on. 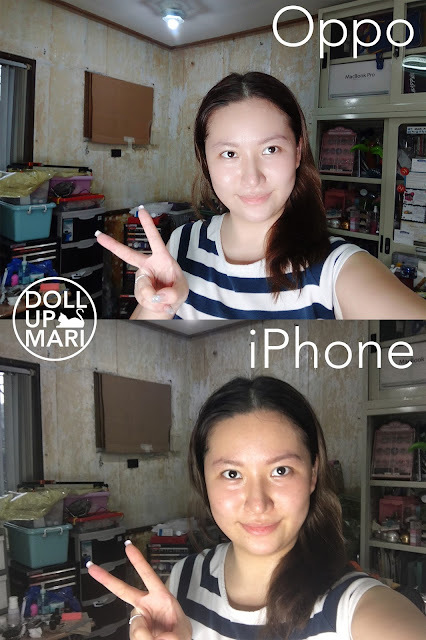 Makeup can fix a lot of things (so many things wahaha), and when I have makeup on, it's no longer hard to photoshop if I really want to make edits. The real challenge is when I don't have makeup on. This is the comparison of my photos without makeup. I still look like myself on the right, and it doesn't look overtly done in any way, but once you see the photo on normal mode, you will immediately realize that I actually have so many red discolorations (I'm part Dutch and this is how the tiny percentage manifested), and that I have heavy eyebags. I also sweat a lot, so in reality, I had a bit of sweat on my face while I was taking the selfie. I am so amazed that I still look like myself on Beauty Mode, and that once you zoom in, there's still some pore texture left that it still looks authentic. It's weird if it's too smooth. I also wanted to see how powerful their Groufie promise is. And welp, it really is true. I was standing on the same spot, taking the photo with the phone from the same distance, and yet these are the results. It's quite apparent that in the OPPO photo, you see more of my beige cabinet. And yes, to those who are wondering, this is how my workroom looks like right now due to the renovations huhuhu. I really liked this because it was true to the brand's promise that you'd be needing selfie sticks less, even for group photos. The beauty mode is also helpful, as always. I also wanted to make a comprehensive comparison, and a comparison on different subjects. I tried taking photos of my manicures in the three setups. I used the same filter on all of them, so it's all equal. I like that the iPhone captured the most light, but OPPO Beauty mode got rid of the wrinkles on my finers. I also like that nail design wise, OPPO brought out the galaxy look more. 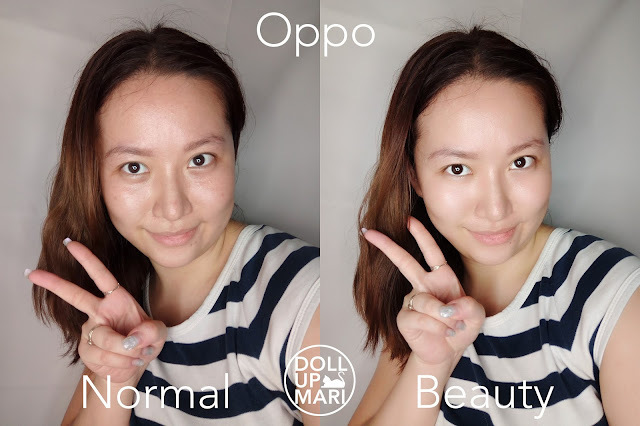 Whether normal or beauty mode, OPPO brought out the beauty of my manicure. I used pink and blue fairy powders on top of hologram powder, and added silver mica flakes as well as opal foils. In real life, my manicure has soooo many details goin' on. 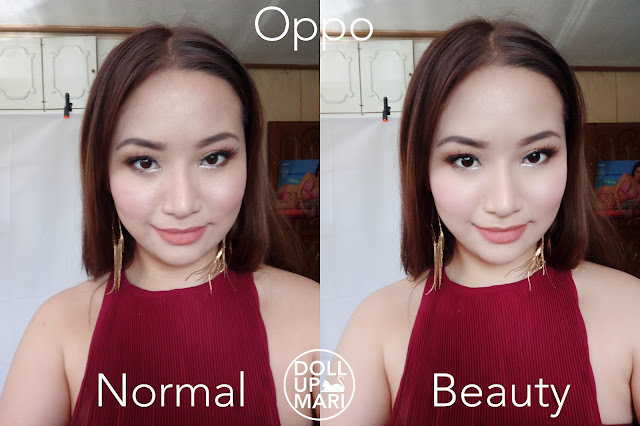 I like the color temperature of iPhone the most generally, but design wise, OPPO brought out the opals and the fairy powders the most. And I feel that for those who are into manicures, it's nice that the camera only got rid of the wrinkles on my fingers and did not subtract to the details of the nail design. I also took selfies with the three! I like iPhone's color temperature the most. My hair in real life is most accurately portrayed by iPhone (it's supposedly a dark ash). You will see that in OPPO, my hair is suddenly brassier. Perhaps for people who work a lot on hair, this is something to ponder upon, especially if your job entails showing hair color to clients. But for those who work in beauty, it's amazing that on beauty mode, I really nail the "Gandang Pulbo at Lip Tint" trend even if the other photos show that that's not exactly the case. The color temperature may have made my hair a different color, but I like how I have the perfect pinkish glow. 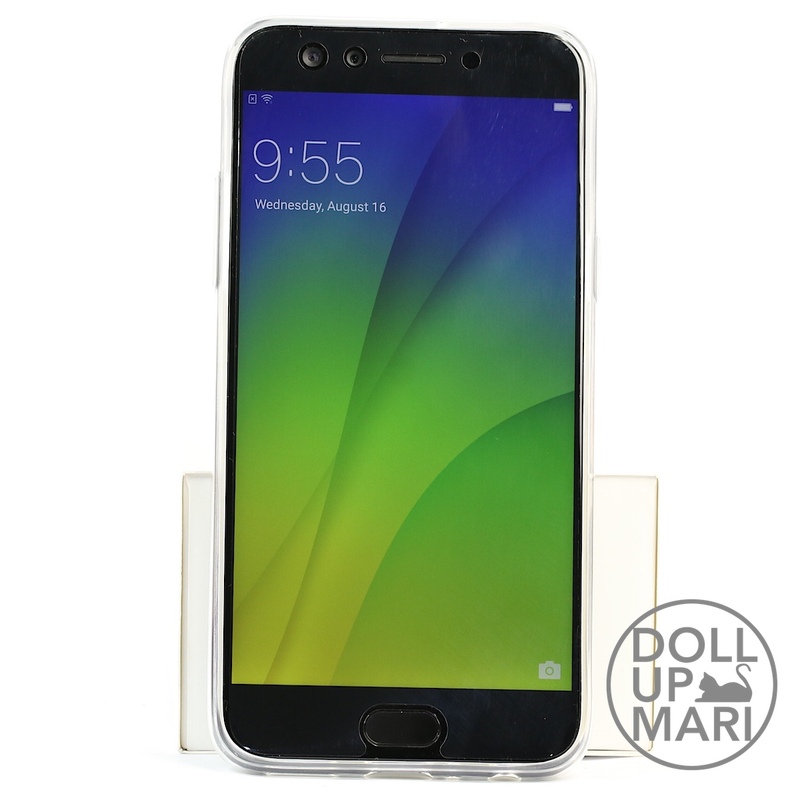 I also like that OPPO captures just the right amount of glow spots for it to look like a healthy glow in the photos. iPhone never lies if my face is oily hahaha, as how I look here. Using OPPO was like using powder as well, even if I only had tint on my cheeks and lips in these photos. But when it comes to the macro game, I'll have to be honest that iPhone wins this round. Perhaps the filtering of OPPO means that this lipstick from Maybelline looks less detailed and vivid. I know, both photos are already a bit grainy. 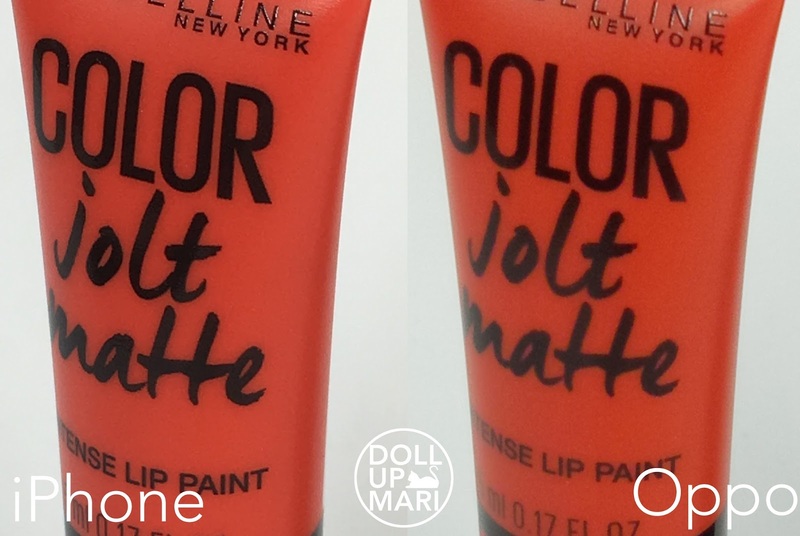 But if you zoom in, the printing of Maybelline on the tube is more prominently seen on iPhone versus OPPO. The words "Color Jolt Matte" also looks more vivid on iPhone. Though I'm impressed that both phones came out with a similar color temperature. 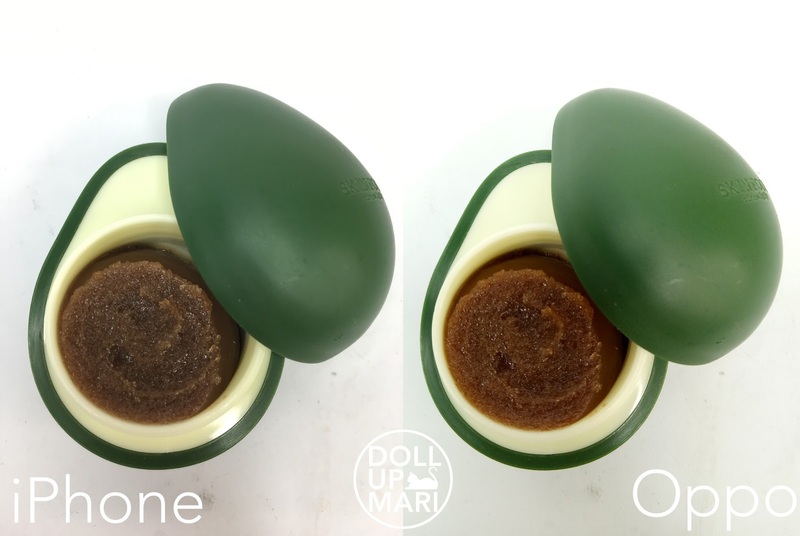 And just to show what I mean when it comes to product photography, here's a photo of my holy grail Skin Food avocado lip scrub. There is no winner here, because I just wanted to show the different things the two phones would do. It will really be about your preference. iPhone is more true to color and more clear, but as you will also see, the dirt on the white surface is also more conspicuous. 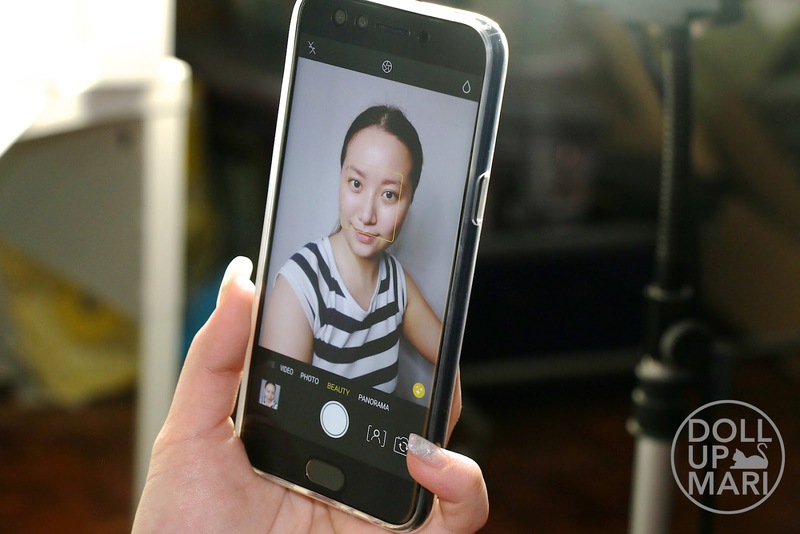 With OPPO, the color temperature is not 100% accurate, but the scrub looks more appealing, and the specks of dirt aren't as obvious. So those are my comparison photos! I like that in general, the camera on this phone makes everyday living easier for all the users, and it also elevates the quality of photos that people are taking. In the selfie generation, it's really important to have something that's lightweight and easy to use, but something powerful to take stunning photos. And something that's generally functional. I just didn't delve on the other things, but I could really feel the 4GB RAM as the phone was fast and I could go from app to app seamlessly. As for filters, I was just never a fan of "No Filter Beauty" because I'm quite realistic that the people who do not need photo filters are people who get invasive facials (dermaroller, peels, harsh lasers). Or people whose yearly skincare expenses are equivalent to several new motorcycles. The Philippines is generally so hot that we're really bound to have our pores more open compared to if we're not in a place as hot as this. Overall, getting a camera with a good beauty function like this is waaay cheaper and safer than going for all sorts of invasive facials. I honestly do see myself buying this phone because I feel that at 15,990, this has so much value for money. 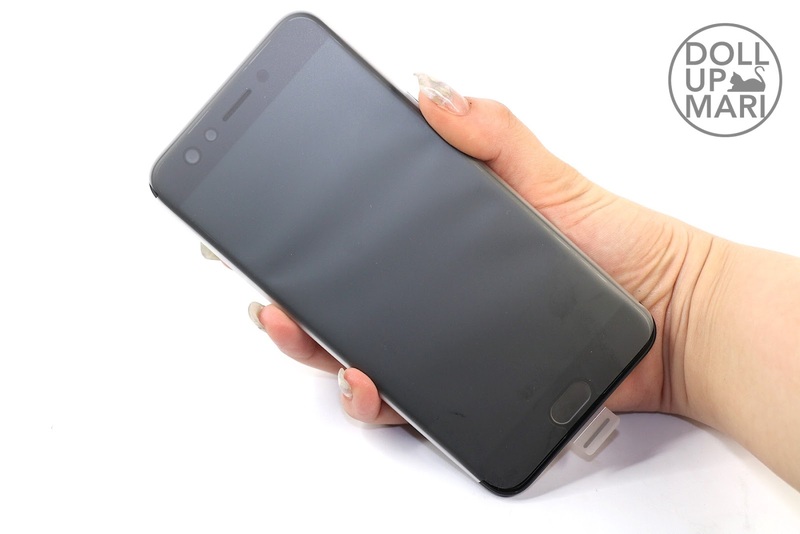 The casing, screen protector, fingerprint scanner, super fast interface, and the really awesome camera, all feel like a good deal to me.